Dry Skin Vs Dehydrated Skin. Dry skin may be one of the most common client complaints, especially when working with mature clients. The first step in addressing this problem is to differentiate between dryness and dehydration. It is important to separate these two issues initially in order to determine. Once this has been done, the whole picture can be evaluated to develop an effective treatment plan. There will often be overlap, and the two issues usually impact one another directly. Fortunately, there are a range of treatments available from traditional treatments to cutting-edge technologies to help comfort and treat both dry and dehydrated skin. Dry Skin Appearance Indications. Dry skin is a skin type that is related to oil production. Skin is genetically predisposed to inadequate oil production, which leads to chronic dryness, or skin may become dry as oil production decreases with age. Skin with normal oil production will have a light hydrolipid film composed of oil, as well as perspiration and moisture from the air. The t-zone may produce more oil than other areas. Commonly, clients observe oil in the t-zone and believe that they have overactive oil production. Many believe that skin with no oil whatsoever is the healthiest and so, even those with normal oil production may resort to stripping their skin with harsh cleansers in order to remove all traces of it. It must be explained that they need this film to keep skin properly protected and hydrated. Dry skin presents with a lacking or nonexistent hydrolipid film. It may appear tight, dull or may show signs of premature aging. 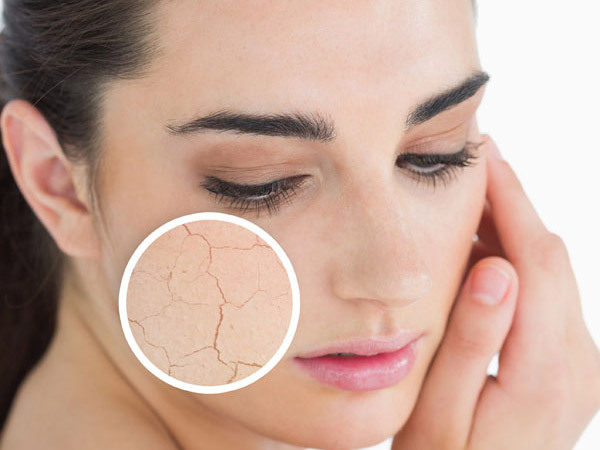 This dryness and lack of barrier function is a leading cause of dehydration because, with no protective barrier, skin is susceptible to transepidermal water loss. Even if enough water is being taken in, the skin will be unable to retain that hydration. Potential Causes. Because dryness is a skin type, those afflicted are simply genetically predisposed to inadequate oil production. However, several factors can worsen this type of skin or make otherwise normal skin feel dry by reducing surface oil. Some of these factors include powdery makeup that absorbs the oil, using harsh products that strip away oil instead of those that are additive and protective, as well as certain medications. Potential Causes. Common causes of epidermal dehydration include lifestyle choices, such as smoking, medication or illness; a diet high in salt or stimulants, such as coffee; environmental factors, such as seasonal changes and the artificial indoor environments caused by both heating and air conditioning, or sun damage, which can cause moisture loss and lead to dermal dehydration.Additionally, those with redness-prone or rosacea skin can often experience a higher rate of epidermal dehydration, because the heat present with their condition can encourage epidermal water loss especially in the instance of impaired barrier. Although drinking enough water is vitally important to hydrated skin, this alone cannot prevent dehydration. Even if a client drinks the right amount of water, if the skin’s barrier is impaired, the water is likely to be lost through epidermal dehydration. Multi-Weight Hyaluronic Acid. Hyaluronic acid is well-known as one of the most effective skin-hydrating ingredients. However, only by featuring multiple weights of hyaluronic acid, different aspects of hydration and skin health are addressed. Normally, medium weight is the common type which helps draw moisture to the skin for general hydration. A low-weight hyaluronic acid allows hydration to penetrate deeper and more quickly in order toimproving elasticity. Additionally, a high-weight hyaluronic acid sits nearer to the surface of the skin and acts similarly to a dermal filler, helping improve surface hydration, and make fine lines and wrinkles appear less visible. choose serums and moisturizers that incorporate multiple weights of hyaluronic acid. Oil Infusion. When steam is not contraindicated by any other skin concern, an oil infusion can be an effective way to help correct barrier impairment to address dryness. This will generally improve epidermal hydration. In order to perform an oil infusion, a noncomedogenic oil should be applied to the skin after a thorough-yet-gentle cleansing, toning and exfoliation. The oil should remain on the skin as steam is applied and left in a comfortable position for 10–15 minutes. The heat and moisture from the steam will allow the oil to facilitate barrier repair. Niacinamide. A potent form of vitamin B-3 takes a multifunctional approach to hydration by addressing several aspects of dryness and dehydration simultaneously.